Russia has all but secured qualification from World Cup group A with a comfortable 3-1 win over Egypt at the Saint Petersburg Arena last night. Stanislav Cherchesov's men were commanding in possession and secured all three points with 3 goals in the space of 15 minutes in the second half to unceremoniously end Egypt's hopes of making it to the next stage of the tournament. The hosts took the lead when Roman Zobnin's delivery into the box was deflected into the back of his own net by Egypt skipper Ahmed Fathy just shortly after the half-time break. Russia were at it again 12 minutes later and extended their lead through Denis Cheryshev who made no mistake after getting on the end of a reverse pass from Mario Fernandes. 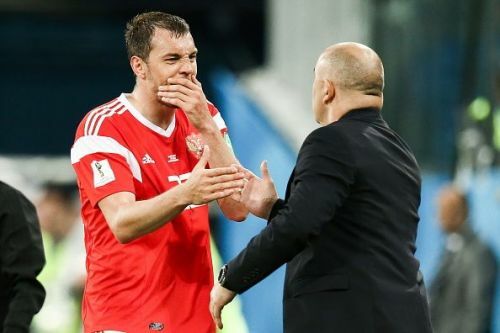 Artem Dzyuba put the game to bed with a well taken finish in the 62nd minute, leaving Egypt with a mountain to climb if they were to keep their hopes alive. Mohamed Salah pulled one back for the Pharaohs from the penalty spot in the 73rd minute but it was a little too late for Egypt to salvage something from the game. Without further delay, let's take a closer look at a number of factors that helped Russia put Egypt to the sword in this encounter. 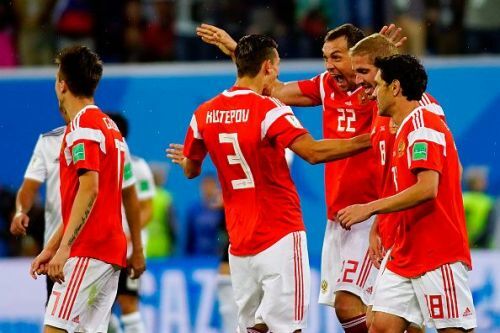 Stanislav Cherchesov made the two very obvious changes from the team that faced Saudi Arabia in the inaugural game of this year's tournament when his side locked horns with Egypt in St Petersburg. Denis Cheryshev, who scored a brace in the opening game replaced the injured Alan Dzagoev while Artem Dzyuba was given the nod ahead of Fyodor Smolov in attack. Both players added more dynamics to Russia while going forward and rightfully repaid the manager's faith in them by getting on the score sheet for the hosts as they cruised to yet another convincing win. The team selection was far from surprising and it looks as if it is here to stay for the remaining group game against Uruguay.